If a column of names is in all UPPER case but you need it in Proper case, instead of retyping everything, add a column, write a function that changes the data. The function is =PROPER(cell address. This process also works in Excel 2013 & 2010. Step 1: Insert a column to make room for the function. Point to the column immediately to the right of the all uppercase column. Right click on the column letter and choose Insert. Step 2: Title the new column, for example, Name. Step 3: Select the first empty cell in the new column. 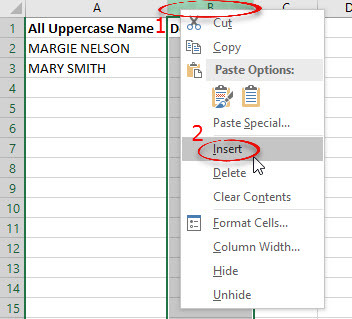 Step 5: Click on the cell immediately to the left which contains the all uppercase text. This writes the cell address for you. Step 6: Press Enter. The function displays text in proper case. Step 7: Copy the function down the column. More information in Excel Help: Click the ? or press F1 for help. Search for "Change the case of text." This Microsoft article describes the Proper function in detail.